The Markets had a volatile and range bound session again on Friday as it ended the day with minor gains after capped movement. The Markets saw a negative opening but formed its intraday low of 8452.25 in the early minutes of the trade. Post this negative opening, the Markets recovered in the morning trade to trade flat. The Markets witnessed a range bound sideways movement thereafter and hovered around its previous close levels. It was in the second half that the Markets saw some up move as it went on to add some gains. It surged a bit to form the day’s high of 8530.75 in the late afternoon trade. It hovered around this level and retraced a bit to finally end the day at 8513.80, posting a minor gain of 19.65 points or 0.23% while forming a similar top but higher bottom on Daily Bar Charts. The Markets are likely to witness a flat to modestly positive opening and is expected to continue with its up move but initially witness a range bound trade. The Market is now trading above its all averages and under such structure is usually expected to extend its gains. However, given the technical structure of the Charts, some ranged movements also cannot be ruled out. The levels of 8545 and 8590 would act as immediate resistance on Daily Charts whereas the levels of 8452 and 8410 can act as support. The RSI—Relative Strength Index on the Daily Chart is 62.0565 and it has reached its highest value in last 14-days which is bullish. It does not show any bullish or bearish divergences. The Daily MACD is bullish as it trades above its signal line. 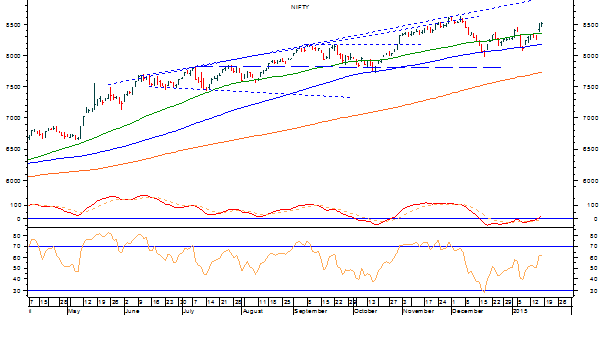 On Weekly Charts, RSI is 64.5743 and remains neutral as it shows no bullish or bearish divergence or any failure swing. The Weekly MACD remains bearish trading below its signal line. On derivative front, the NIFTY January futures have shed over 5.70 lakh shares or 2.77% in Open Interest. This, as we have been mentioning in our previous editions of Daily Market Trend Guide, is little cause of worry as each rise is being attributed more to short covering than fresh buying. It is necessary for the Markets that it sees fresh positions being built up on the long side which would fuel its upside. Coming to pattern analysis, the Markets currently trades above all of DMAs. In event of any downside, the 50-DMA is again expected to act as support. Given the overall structure and F&O data, there are also chances that the Markets see some ranged movements before it continues with its up move. The overall trend remains intact. All and all, it is necessary that we continue to exercise caution in the Markets. There are chances that the Markets see some selling pressure from higher levels and consolidate before it moves up again. This ranged movement is also likely to see some volatility ingrained in it. Overall, it is advised to refrain from aggressive purchases. Cautious optimism is advised for the day while adopting highly stock specific approach.